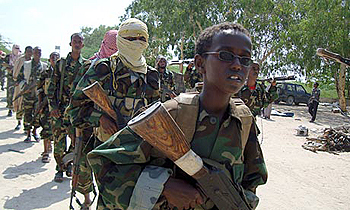 A young boy leads al-Shabab fighters on a military exercise in the Suqaholaha neighborhood in northern Mogadishu, Somalia. U.S. Assistant Secretary of State for African Affairs Johnnie Carson recently announced the long-expected Obama administration's policy towards Somalia. He stated that the administration will pursue a two-track policy in order to find a lasting solution to Somalia's crisis. In the first track, the United States will continue to support the Transitional Federal Government (TFG), and in the second, it will engage current "governments" in Somaliland, Puntland, and other regional or clan entities. With that backdrop, a question that begs answer is, does the new approach help or hurt its declared goal? It is fair to say that Somalia's current environment is one full of grievances, hostility and mistrust. This is because we committed unspeakable atrocities against each other. The tragedy is that most of the indiscriminate killings and destructions were committed in the name of the state, first allegedly to maintain its integrity, and later to restore it. What began as genuine uprising against the dictatorial regime soon turned into horrible civil war that led brothers to kill each other. We are now in another round of the most violent warfare, one led by psychopathic individuals who masquerade their identities behind various facades while inciting more violence, and whose goal is nothing but power and self-aggrandizement. As a result of this hellish experience, our collective identity as Somalis is seriously damaged. Our identity as an ethnic group with one religion, language, culture and history is in shambles. Some of our current leaders deny our cherished characteristics; instead they emphasize subtle differences. In this unnatural climate, these leaders have many examples to prove their case. Reacting to the bewildering perpetual violence and increasingly worsening security condition in our country, American policy makers seem to have devised a policy that has all the hallmarks of Somalia's current political environment: bizarre, alarming, ambivalent, and one that is also positive and timely. One can easily question how the Obama administration, despite its much-publicized extension of an olive branch to Muslims, abandons the TFG, which it co-sponsored. The administration did not take similar measures in their dealings with Iraq and Afghanistan governments; they did not resort to go outside the weak, but internationally recognized, governments. The new approach is at best contradictory. How can the U.S. administration co-sponsor a bloated 550-member parliament that is considered inclusive and representing all regions and clans, and at the same time bypass these leaders and engage their counterparts in the same regions and clans? Where would the process of engagement end? On the other hand, the new approach has a double edge. Depending on how it is carried out, it can help or hurt in finding a lasting solution to Somalia's perpetual violence. First, if the policy is judiciously implemented, taking into consideration Somalia's unique religion, culture and historical ties, the odds of success are high. If, however, the new policy is put into effect in accordance with the current concocted classification of Somalia as a conglomerate of hostile clans that ought to be exploited, the risks are great. Ethiopian leaders' pursued the second option. They have succeeded in containing violence within the Somali border, a feat as far as their country's security is concerned, but, at the expense of crippling the TFG's efforts in nation building. Instead of spearheading a win-win strategy to rid extremism by strengthening the security of both nations, they opted to exploit their brothers' weakness and ride the speedy clan train. Second, if the new approach focuses on development projects, such as agriculture, water, health and education, it would be beneficial. However, if the policy is used as a cover-up for CIA's operations, it would be counterproductive. This is the first time the U.S. government has a comprehensive policy towards Somalia since its collapse of state in early 1990s. Most of the past 20 years, despite the suffering in Somalia, the United States and its international partners had either no policy, or if they had one, it was uncoordinated and contradictory. As Ambassador Carson admitted, the previous responses of Somalia's internal crisis were "too feeble, too slow and too uncoordinated." The policy is also positive because it is a rejection of the so-called "constructive disengagement," which called for hand-off policy towards Somalia, leaving Somalis to solve their own mess. This approach was ill conceived at best, considering the fact that it was the Bush administration's narrowly focused war on terror that greatly contributed to the mess itself. The diversification of contacts will also be positive if American officials are genuine to discover and appreciate the complexity of Somalia's internal political dynamics and go beyond the facade of external appearance. By engaging clan leaders, American officials would be surprised to find leaders who jointly advocate a project, but separately advance different or opposing ones; leaders who fight as one team today, and are in conflict with each other as separate teams the next day; and leaders whose militia are fighting during the day, but are socializing together at night. American guests will soon realize that the nebulous clan phenomenon is more complex than at first glance. And that I consider to be a positive development. Finally, the U.S. dual-track policy is timely. Somalia's name has become famous for all the wrong reasons. It is known as the land of clan warfare, terrorism, piracy, number one on the list of failed states; also number one in corruption, and the longest stateless country in modern history. The cancer that put our state in a coma is spreading like wild fire in the region and beyond. Fed up with this enigmatic and endless violence, the Obama administration seems to be ready to act. More importantly, the new approach serves notice to those who incite and perpetuate the violence, as well as those who undermine the effort to end it. U.S. partners should soon be on board. In conclusion, despite its resemblance of Somalia's unnatural environment, the U.S. dual-track policy will be constructive if American officials are curious enough to discover the intricacy of Somalia's internal political dynamics that propels the seemingly endless violence, while avoiding potential hazards that undermined previous approaches. Said Liban is a Canada-based freelance writer. His email address is saidliban45@yahoo.com.